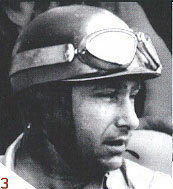 He won five world titles and 24 races from 51 starts. Broke his neck in a accident at Monza GP 1952 when he was thrown out of the car, After his last GP in 1958, he never raced again, but he often returned to the circuits as a popular guest. He was noted for being able to win a race at the slowest possible speed.